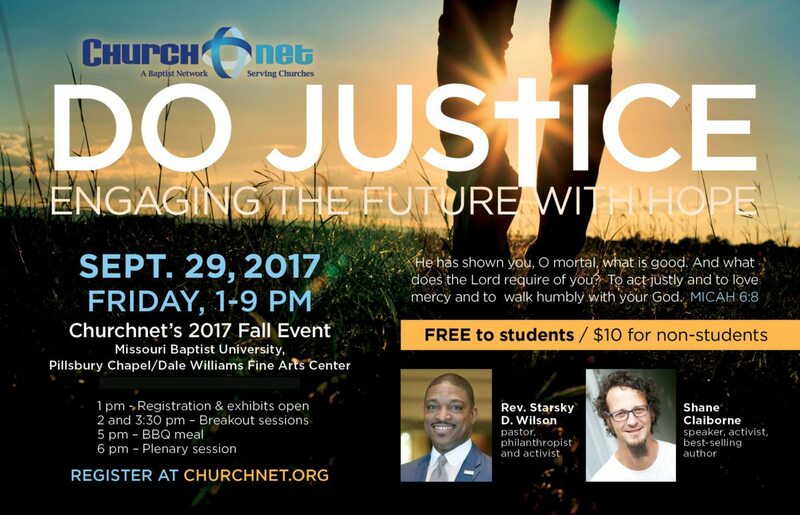 Join us for our 2017 Fall Event “Do Justice: Engaging the Future with Hope.” The event will be September 29 at Missouri Baptist University in St. Louis (One College Park Drive, Saint Louis, Mo. 63141-8698). Plenary Session speakers will be Shane Claiborne and Starsky Wilson. Breakout sessions will include sessions by David Gerth of Metropolitan Congregations United, Cassandra Gould of Missouri Faith Voices, and Bruce Gentry on International Student Ministry. Dinner, which will feature BBQ from Pappy’s Smokehouse, begins at 5:00 p.m.; it is free for students and $10 for everyone else.